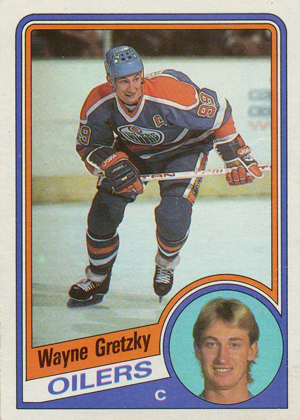 Topps ceased production of some of its lesser-performing lines after 1982, including hockey and basketball cards. After a two-year hiatus, they returned to the ice for 1984-85 Topps Hockey. At only 165 cards, it is the smallest hockey set that Topps had issued since 1972. But a small set is better than none at all. The front design looks like a retooled version of the 1983 Topps Baseball design, which was itself borrowed from the company's 1963 baseball design. 1984-85 Topps Hockey has two pictures of each player on the front of the card, a main photo and a smaller photo inset inside a circle in the lower right. A colored stripe extending at an angle away from the inset contains the player's name, with his team name in a white stripe below that. His position is noted underneath the team name. The backs are vertically oriented and have text superimposed over a graphic hockey stick. A blue strip at the top contains the player's name, with his vital stats below it. The card number is shown inside a circle, followed by year-by-year statistics and a biography where space allows. Cards are arranged numerically by team, with each member of the team grouped in alphabetical order. The teams based in Canada are woefully represented in comparison to those from American squads. Cards 153 through 162 feature All-Star players and a checklist card ends the set. Due to the set size, 66 of the cards are considered to be single prints. However, there is little premium attached to the single-printed cards. The key card in 1984-85 Topps Hockey is the Steve Yzerman rookie. Other notable rookie cards feature Dave Andreychuk, Tom Barrasso, Pat LaFontaine, Dave Poulin and Pat Verbeek. Any rookies missed during Topps' two-year hiatus were featured in O-Pee-Chee sets and are not considered to be rookies here. (105) 1984-85 Topps #122 Ron Sutter Philadelphia Flyers RC Rookie Hockey Cards ! Paul Coffey OPC Topps Hockey Card LOT of 3! 84 85 85 86 86 87 HOF'er!! 1984-85 TOPPS HOCKEY COMPLETE SET YZERMAN LAFONTAINE RC ALBUM NMMT NICE!